How can user-installed VMs from non-authorized templates be detected and secured? Virtual machines that are installed from cloud consumer templates need to be discovered and secured from any known vulnerabilities. An IaaS consumer has the ability to install VMs that have not been vetted for security by the cloud provider. A system that includes an internal usage policy can be established, providing network and endpoint security that is VM-aware in order to locate and identify virtual machines and report and secure them. 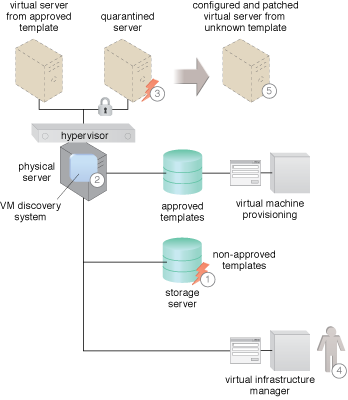 Using host-based security, including host-based VM discovery software, emergent VMs can be discovered and reported for further processing. A non-approved VM is installed on a hardware server (1). The VM discovery system discovers a rogue VM (2). 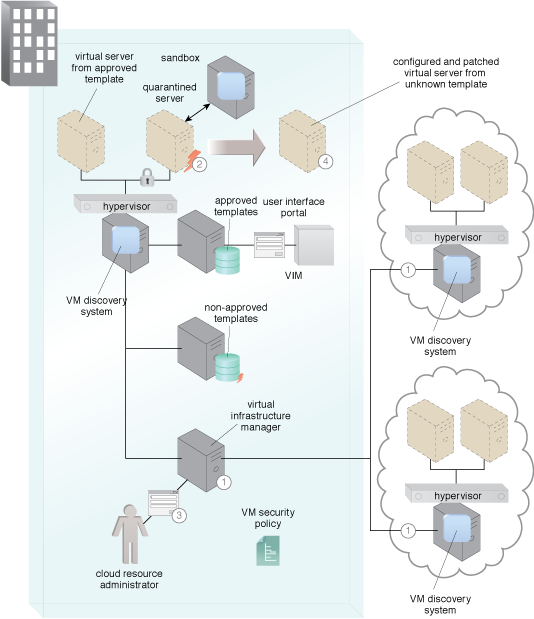 The VM discovery system quarantines the VM (3). The discovery system alerts an administrator (4). The administrator takes steps to configure and patch the VM to meet security requirements for use. Alternately, they could make the determination that an approved template can meet the requirements of the consumer and replace the vulnerable template (5). A master VM discovery system monitor communicates with each host’s VM Discovery System. It sets the security policy describing what security profile the VMs should meet (1). It monitors the number and security state of each VM according to policy and part of internal usage policy, alerting if a rogue VM is discovered. It takes both immediate automatic mitigation steps as well as alerting administrators. Mitigation steps can include moving image to a sandbox area for provisioning and eliminating any networking possibilities as a quarantine measure. It controls multiple platforms both on-premise and in the cloud (2). The monitoring system alerts the administrator of anonymous situations and actions taken (3). The monitoring system mitigation steps establish a properly provisioned VM ready for addition to the network and enterprise (4).